New Phantoms' import Petr Stapanek in action against Swindon. Photo: Tom Scott. Peterborough Phantoms caused plenty of sets of eyebrows around the English Premier League to be raised last night (September 11). The city club collected their first success of the new campaign when cruising to a 6-1 triumph against Swindon in their opening Planet Ice outing. Darius Pliskauskas drives forward for Phantoms against Swindon. Photo: Tom Scott. There was no sign of the laboured display which led to a 2-1 reverse in Sheffield the previous night as a rip-roaring first period laid the foundations for an accomplished performance as Phantoms tormented their highly-touted opponents. There was speed, skill, aggression and some ruthless finishing all aided by a miserable display from visiting netminder Stevie Lyle, who is often a match-winner at this level. But not last night. He was utterly bamboozled by the ferocious early assault as a Phantoms side, tipped to struggle by many, laid down a marker much to the delight of their coach Slava Koulikov. 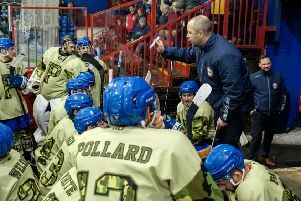 He said: “We played some very decent hockey and that was great to see after our performance in Sheffield the previous night not being to the standard we expect. “But less than 24 hours later, the guys were reborn. Every single one of them showed up and everyone saw what happened as a result. Phantoms were ahead inside a minute as new import capture Petr Stepanek waltzed in on goal before lifting the puck past Lyle. Swindon didn’t take long to level as Toms Rutkis fired a snapshot past Janis Auzins, but a spell of three Phantoms goals in less than two minutes soon had them in the ascendancy. Darius Pliskauskas grabbed the first of them after some fine work around the boards from James Archer before captain James Ferrara and defenceman Tom Norton struck from range just 19 seconds apart. Both sides also had goals washed out in an action-packed opening 20 minutes, but any fears of a Swindon fightback were ended only 26 seconds into the middle session when summer signing Archer forced in his first Phantoms goals for eight years. Further gloss was applied to the scoreline when Stepanek carved out a simple chance for Martins Susters just before the mid-point of the final period. That was the end of the goalscoring, but not the excitement as, having already bagged a goal and an assist, Norton completed his own hat-trick when dropping the gloves with Swindon man Kyle Smith. Considerably tougher tests will presumably lie ahead for Phantoms in the next two weekends when they face reigning champions Basingstoke and a team tipped to succeed them in 2016/17 – Milton Keynes. Phantoms travel to fierce rivals MK, who started the season with a four-point weekend, on Saturday (September 17, 7pm), before hosting Basingstoke (who suffered back-to-back losses at the start of their title defence), on Sunday (September 18, 5.30pm).